Ask fellow campers about "Hi-Pines Campground" and nearby attractions. We got here a few weeks before closing, so it was relatively empty. The spots were plenty long enough for rv and tow. Easy enough to unhook by the office. We were in an open area, which was what we wanted for satellite purposes. There is a wooded area more suited to tents and smaller campers. Staff was very welcoming. I believe they have lots of activities during the summer season. Wifi was good, weak verizon signal, site was fhu. Walking trail behind pond and an atv trail also. Staff was great, helpful, spots pretty level, easy navigation to spot. We camped at Hi-Pines Campground in a Motorhome. Went there to see a cranberry bog at Lake Nokomis Cranberries. Unfortunately, because the weather was too warm, they were not harvesting at that time. They had a nice gift shop though and we got lots of cranberry products. Shower house is great, excellent/friendly staff, good campground for kids (lots of activities), dump station location can be tricky if its crowded, our site was too short for our 35ft TT, but didnt feel like hooking up and moving, bring extra hose and extention cord (every other site has hookups on opposite side. Stayed four days (W/E site). We camped at Hi-Pines Campground in a Travel Trailer. Eagle River golf course is pricey but very nice. Recommend Catch 22 Restaurant for a nice meal. Very nice park. Watch how much they charge you. They charged me the $40 rate it should have been $37. I had PPA so I only paid $20 per night. We stayed 2 nights. Their computer system is very slow. It took us 20 minutes to ck in. The park is great for kids. A lot of things to do. Bring ant deterant. I would stay again. Sites are very level on the South side. We camped at Hi-Pines Campground in a Fifth Wheel. The price paid seemed high for this late in the season based on what this park had to offer. The older part is lovely, wooded but with some tight maneuvering. The newer part is open and flat with no trees. Several areas were flooded out in the flat area by a man made pond. Since we stayed here during Cranberry Festival weekend no discounts were honored. There is small "waterpark play area" on the man made pond that was closed for the season. I imagine kids would love it. The service wasn't great - when we called for availablility we were urged by the office staff to make reservations (and pay in advance) which seemed odd this late in the season. The place was half full when we arrived. The people we were traveling with had a health emergency at the last minute and had called that morning to cancel. Each of us had paid for one night in advance. No refund was offered to them and we weren't even allowed to use their payment as credit for our second night. We have found many places that are flexible around health issues but not them - very curt about the issue. We camped at Hi-Pines Campground in a Motorhome. Easy access off Hwy. 45; back-to-back sites. Our site, #123 was roomy and mostly level, other sites are closer together. This park was quiet in mid-Sept., but there are plenty of amenities for families with kids - swimming pond with sandy beach, bouncy house, and more. Would be nice if they fenced their "Dog Park". We would stay here again. 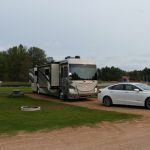 We camped at Hi-Pines Campground in a Fifth Wheel. They have added add'l sites and amenities in kid's play area since our last visit. Rate is for 30 amp which had trouble keeping up with our 2 space heaters and coffee pot, necessities in the below freezing temps. The campsites in the older part of the park are beautiful, wooded and private but can be tight for larger rigs. The newer part of the park, next to a man made pond, of is wide open with not many trees. The dog park they have listed is just an open field with no fence. A short bike ride along the highway to the sidewalks that lead to town. We camped at Hi-Pines Campground in a Motorhome. This is a beautiful area for fall foliage touring, golfing, fishing, shopping in the many nearby towns. The park has access to both horse and atv trails. Customer service was Terrible: check in my husband was ignored for several minutes & presided to help another customer who walked in after him. Poor Directions where given to our camp site. As well as poor instructions on site lines. Site 20 has 2 fire pits one deemed unusable making it very confusing where to park trailer. Ended up needing to purchase longer electrical cord & water hose. Other campers walked right through our site to get to pond. Pond is very rocky shore many weeds. There where also many other issues that arose during our two night stay. Staff did little to nothing about any of our concerns. At checkout I once again expressed my frustration to a female staff member (manager) regarding the site 20 she said She didn't know there was two fire pits..Ok your the manager for 4 months & you don't know your campground? 1st & last time we'll stay there. Paid a lot of money to stay there. More than state campgrounds in Michigan. We camped at Hi-Pines Campground in a Travel Trailer. We were looking for a place with full hookups, and they only had two of their unoccupied seasonal sites available. Our site was level, open, with a few trees. The site next to us faced our site, had there been somebody in that site we literally would have been next to each other (within a few feet) had we all been outside. From what I saw this probably was the only site in the campground like this. Our utilities also were at the wrong end of the site, we had to run 20' of sewer hose. If you camp anywhere close to the pond you will be in a field, sites closer to the entrance are more wooded, but some seemed difficult to get into. Overall, not a bad private campground. Things they could do better. Our site looked out over a huge open field close to a storage facility. There were several boats and campers stored right across the road from our site. Some were eyesores to look at. If they moved them to the other side of the field that would resolve the problem. They require that you only purchase firewood from them, if a campground is going to require this, the wood must be reasonably priced. We paid $15.00 for 18 sticks of wood. Almost a buck a piece. I would say that is almost double than what I am used to paying. The wood was of high quality though. There is a guy selling wood right at the entrance of the campground, at first glance it appears that it is part of the campground but it is not. This needs to somehow be more clear when you pull in. The pond was just ok, smaller than I expected. They need to figure out how to drag the beach once a week or so to remove weeds and grass. They have a nice check in/sitting/bar area with a nice outdoor patio overlooking the pond. We camped at Hi-Pines Campground in a Travel Trailer. I rode my bike on the Three Eagles bike trail. Very nice and starts in downtown Eagle River. It is a limestone type surface trail. Our site (#2) was right by the clubhouse and nice clean modern showers and toilets. Good number of both. Over-the-air TV had a great picture. Wi-Fi OK. We liked being by the pond because it was close to showers. Site not level. Did not have enough levelers. We expected Wi-Fi to be better. Park was pretty empty. We camped at Hi-Pines Campground in a Motorhome. This campground has some nice sites. Many of the the sites, though, are out in the open with no trees. There was a play area in the water but they let locals use it so it got crowded. Convenient bathrooms. We camped at Hi-Pines Campground in a Tent Trailer. The rate reflects Passport America - found them liberal with their number of stays which was nice. Our original site was not vacated as records reflected so we ended up on the main road with the pond/play area behind our rig. Heard several complaints how the park has gone down since last year - one major blow up slide has a hole in it and they continued to have to blow it up. This is a family playground park and doesn't really meet our needs. The grassy site was mostly level. The sewer backed up when we were getting ready to leave and they had to come and clean out the drain. We would probably look around for other options before staying here again. 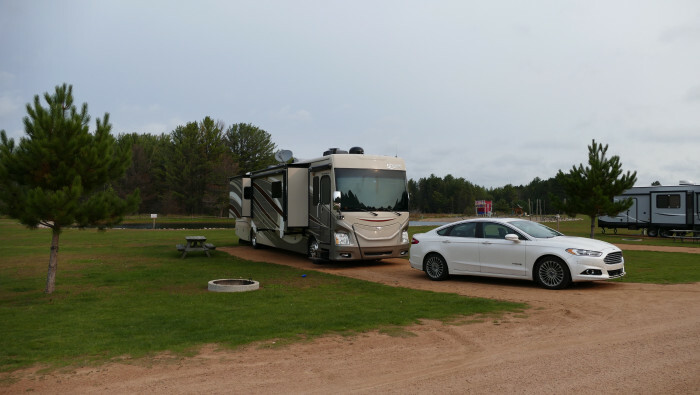 We camped at Hi-Pines Campground in a Fifth Wheel. This is one of the few RV parks that gets a 10-star rating from me! Plus, it's a Passport America park, so the rate was only $19.61 for FHU. Best showers in the world (large, modern, clean) and good hook-up utilities. Nicely laid out park with large playground and play area for kids. Camp supply store on grounds. Large RV spaces and lots of beautiful trees. Nice to walk around and stretch your legs. We camped at Hi-Pines Campground in a Truck Camper. We stayed here to experience the "up nort" high pines environment. This campground has many seasonal campers who are in the trees. Those who are not seasonal are in a meadow surrounded by trees. Sites are fairly level and the spaces not too too close, that is, there is about ten foot between each site and the next sites table. There are numerous activities for children and a store with excellent ice cream and large servings!! They even make pizza. That said, we were here on a motorcycle club weekend. Dozens and dozens of bikes and bikers, some with families. Because of the totally full campground, the internet did not work except in the office. Amazingly enough, the facility did quiet down about 11 pm. We would not come back unless we could be in the trees, but would note their Passport America policy is quite liberal. The staff were particularly helpful. We camped at Hi-Pines Campground in a Tent Trailer. Rate after PA discount. We checked in and paid for two nights here on our way to Oshkosh/AirVenture. We had to leave after the first night because RV parking at Oshkosh was disappearing fast and we had another 3 hours to go. Surprisingly, the fine folks at Hi-Pines refunded our second night. That was very nice of them. The facility appears to be in the process of being upgraded with new features. There's plenty to do here for family fun with a man-made lake with all kinds of fun water stuff. The sites are roomy, but not as level as one would like. We had to block the jacks to get level and the front tires were off the ground, which I don't like. Hence, the downgrade. Water is good and power is good with steady voltage. Our only regret is that we had to leave early and didn't get a chance to really enjoy this very nice RV park. We'll definitely stay here again. We camped at Hi-Pines Campground in a Motorhome. This is a very quiet peaceful campground. The campsites are roomy and some are wooded and some are not. There is a lot of stuff to do nearby like horseback riding and go carts. Like most other places they do not allow you to bring wood in you have to buy theirs and its expensive pine and it burns fast. My family and I will try to make it here next year Its worth the 6 hr drive there. The showers are new and very clean as well as the restrooms. We camped at Hi-Pines Campground in a Tent. Are you affiliated with Hi-Pines Campground ?